A Lancashire man who bit off his girlfriend's nose before going on the run naked has been jailed. 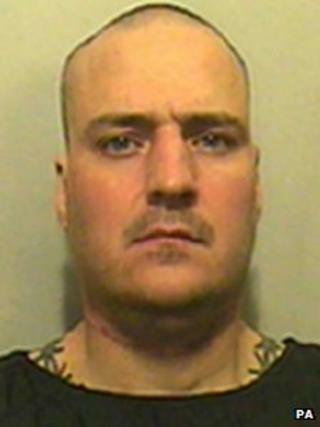 Robert Wilson, 39, from Burnley, attacked Jane Ireland while she slept in her home in July 2010. He hid in woods overnight then tried to steal a car in Simonstone. Armed with a knife, he was arrested after a struggle with police in which he was Tasered. The judge described Wilson as "a plainly dangerous offender" and said he must serve a minimum of seven years. He pleaded guilty at earlier hearings to wounding with intent, carrying an offensive weapon, aggravated burglary and assault with intent to resist arrest. Burnley Crown Court heard Ms Ireland, who is still in a relationship with Wilson, awoke at her home in Hapton Road, Padiham, with the defendant's fingers down her throat. She said that she felt an "excruciating pain" as Wilson bit off most of her nose. She and her 14-year-old daughter escaped the house as Wilson took hold of a large carving knife in pursuit. Wilson, who was naked, then fled to nearby woods, the court heard. The next day he entered a house in Simonstone and threatened the owner with the knife, asking for her car keys. He dressed in some of the woman's clothes but crashed her car while trying to reverse it. Armed officers later found him in Clough Lane. He was told to drop the knife but responded by shouting "come on" and making a sound like a police siren. One officer twice fired a Taser at him, in the chest and back, but Wilson continued to approach him and they grappled on the floor. He was finally detained when other officers arrived. The court heard Wilson had been in a relationship with Ms Ireland for four months. He had been released from a life term in prison, resulting from convictions for wounding, by a parole board a year earlier. Ms Ireland's nose was reconstructed after the attack using skin from her forehead. Gillian Crossley, defending, said Ms Ireland continued to visit Wilson in prison and was "supportive of him". Ms Crossley added that Wilson was a man who needed help rather than punishment. He was told he would not be released until he was deemed to no longer be a risk to public safety.